On the road to building decoding and fluency mastery, students need to incorporate a variety of reading strategies. Likewise, beginning writers need to master some basic writing strategies. The most important reading & writing strategies are simple. They must be incorporated into daily work so that they become routine and students use them without thought. The posters in this unit cover 5 of the most primary reading strategies. Keeping it simple and emphasizing these 5 strategies help readers develop decoding skills and fluency. Find the smaller chunks in larger words to assist in reading fluency. This helps students rely less on sounding out individual sounds and more on identifying sound groups quickly. EX: “at” is a chunk in the word splat. Emphasizes saying the sounds in words in one long breath rather than isolated sounds. When readers sound out new words by slowly blending all of those sounds, their ears “hear” the word better than if they were to isolate the sounds. EX: Instead of s-t-r-e-tch-y, students make a long gathered group of sounds ssstrrrretchyyy. Using picture cues is a tremendous helping strategy for new readers. Encourage students to look at the pictures for clues that will help them determine an unknown word. Utilizing pictures, noting beginning and ending sounds, is a vital beginning reader skill. Explain to students that sometimes when a word is challenging and the other strategies aren’t working, they can skip that word, read the rest of the sentence then use context clues coupled with the sounds they recognize to decipher the unknown word. As students learn more phonics skills they should be encouraged to use both short and long vowels in unknown words. If reading the vowel as short does not work, try it with the long sound, and vice-versa. I keep these strategies posted on my focus wall. Additionally, I give each of my students a bookmark displaying the same posters and information. These strategies are also on their desk nameplates for quick reference. I love to use the quick cards during small guided reading groups. I keep them handy and ask the kids which strategy would be best to use when we come across a word we are having difficulty decoding. Using these strategies during reading is a huge help for my early readers. I incorporate them all along with sight word practice and more in-depth phonic chunk practice every day. The posters in this unit cover 5 of the most primary writing strategies. Keeping it simple and emphasizing these 5 strategies help writers develop great sentences which will lead to improved paragraphs. This constant reminder that all sentences must begin with an upper case letter is imperative. Take it a step further by reminding students that proper names for people and places also start with a capital letter. Often students forget those little periods. Remind them that each thought or idea must end with punctuation. Start with periods, then teach exclamatory and interrogative sentences. For more on sentence types and punctuation, check out Spectacular Sentences. Reminding kids to place a space the size of their finger between words is an essential part of legible writing. Calling it a “spaceman” helps grab student “buy in” and encourage them to practice the proper pacing skill. Often students just need the reminder. Placing this little reminder on your classroom walls and on writing journal bookmarks is a great way to keep your kiddos focused on the requirement. Help students gain insight on this skills by reminding them to read what they’ve written to themselves SEVERAL times. They should be taught to edit and revise as needed so that the sentences and paragraphs they create make sense. I keep these strategies posted on my focus wall as well. Again, each of my students has a bookmark displaying the same posters and information. These strategies are also in their “My Journal” (FREEBIE) for quick reference. 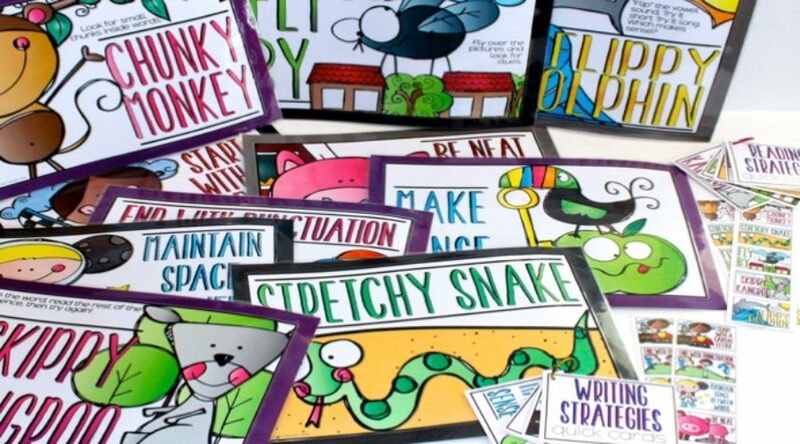 The writing quick cards are fantastic to use in small group lessons. Our RSP teachers and aids like to use them when working with their students. These reminders are a HUGE part of our daily writing routine. My kiddos refer to these resources every.single.day. They use their cues to remind their friends of the most helpful or necessary tool for what they are working on. These amazing children use them as word work/independent activities and play teacher – referring to them and explaining how they should be used. This fun little resource is a definite primary classroom “must have”. Check it out in my store.